There is a scene near the end of the film “Goodfellas” where Henry Hill, the main character played by Ray Liotta, is panicking. He knows he has to sell guns to fit with silencers, cut cocaine with quinine before shipping it to Pittsburgh, pick up his wheelchair-bound brother from the hospital, evade FBI helicopters, and braise pork and veal for a tomato sauce that he must ensure “doesn’t stick.” Filled with swish-pan shots and jump cuts overlaid upon a soundtrack of Harry Nilsson, Rolling Stones, George Harrison, and Muddy Waters, this breathless, unrelenting scene stunningly exemplifies the mis-prioritization of Henry Hill’s cocaine-addled mind, where pork cutlets are as equally important as being pursued by narcotics officers. Of course, Henry Hill can’t see the poetry of his own scene. He can only focus on the details—he has to make sure the sauce doesn’t stick. 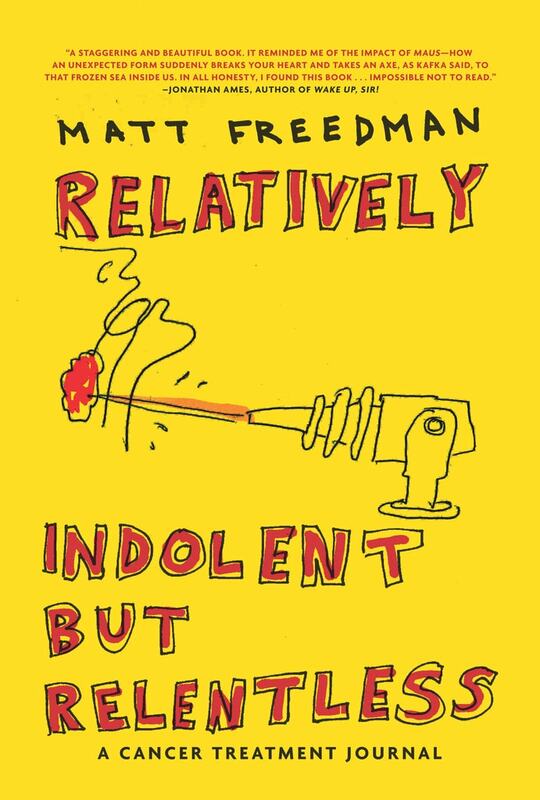 About 20 pages into “Relatively Indolent But Relentless,” the cancer treatment journal that Matt Freedman recorded while undergoing treatment for adenoid cystic carcinoma at Massachusetts General Hospital in the Fall of 2012, one gets that same sense about the author. “I thought larger revelations about life and death would become apparent to me, but not so much,” the author laments. “I didn’t mean to dwell on the day to day experience of eating and worrying and monitoring pain and fear. I’m turning more feral than philosophical as this wears on. Once again, no free pass to enlightenment.” Thus, one third of the way through this graphic memoir, one third of the way through his treatment regimen, the author and reader understand that the real work will begin. Freedman’s assignment is to record the unvarnished, gruesome, and ultimately liberating details of his thirty-five day radiation and chemotherapeutic calendar. And the details are truly fascinating. On October 10, his first day of radiation, he describes the custom construction of his plastic radiation mask that impresses dark, hopefully temporary waffle marks on his chin. Cancer treatment isn’t a passive process, either. Jaw exercises are compulsory, and various swallowing exercises will make it harder for food to enter his trachea than his esophagus. Matt worries about his neck, too. As his radiation treatment trudges along, red, burning strakes punctuate his progressively loosening neck skin, giving him a candy-cane patterned “neck waddle” throughout the book. The candy cane will eventually become the author’s costume—his way to identify with other radiation patients, and his shorthand way to represent the physical deterioration burden he must bear. Food becomes its own hardship. Ice cream, cookies, soups, and grapes are sharp gravel, nails, razor blades, needles in tip of his tongue, a chisel in its underside. Food isn’t decadence, but a pattern of shakes, BeneCal packets, oils and dried cheeses that need to be funneled urgently past his increasingly swelling uvula. Food isn’t nourishment, it is numbers: 3989, 4270, 4230, 4002 calories, his personal version of the baseball players’ batting averages he often recalls with alarming accuracy. But his prize isn’t a batting title, it is avoidance of having to use a feeding “G-tube,” which in one particularly chilling drawing, has become a monster with inward facing teeth. During my medical school and residency training, my perspective on cancer therapy was predictably lopsided. We concerned ourselves with learning how taxanes stabilize GDP-bound tubulins, how ondansetron antagonizes 5HT3 receptors, and the differing goals between curative and adjunctive radiation. By the time I interviewed my first oncologic patient, I had already assumed the collective eye-rolling, de rigueur attitude that define many physicians today: patients all think that they are doctors because they can access the internet. A defensiveness emerges where a physician’s expertise and authority must be re-asserted. This, of course, is stupid. And patients are not. 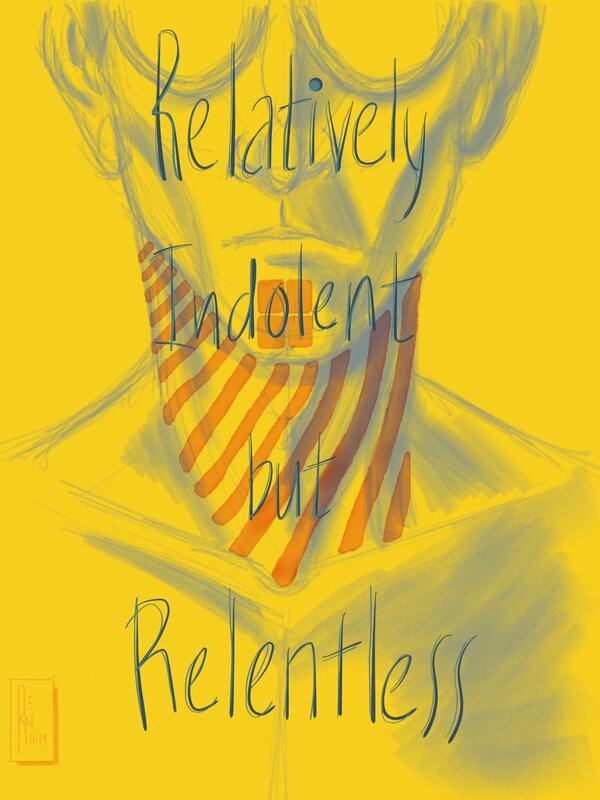 Yet when I read the author’s speculation in “Relatively Indolent But Relentless” that he swears can feel the burn of the radiation during his therapy, I couldn’t help but be skeptical. There isn’t strong evidence in the literature that patient’s can feel this quantity of radiation, I thought. Maybe that’s not the point. His pain and discomfort are real, and are unflinchingly being recorded. Maybe the pain is caused by radiation deflection from an improperly placed mouthpiece, or discomfort and agony from his sore mouth. And maybe my swift focus on evidence-based medicine, and defensiveness, is my routine. Maybe it is the only way I can comfortably make it through such an uncomfortably honest journal. It is the end of the book, and the author finally begins to make larger, over-arching observations about his treatment and this chapter of his life. He is in danger of waxing sentimental and nostalgic about The Meaning of It All. But he miscalculates. He has two more blank pages to fill, and kicks himself for trying to lend perspective to a situation where he, so far, possesses none. So he refocuses on how his cat is sleeping on his bed, and how many pain-relieving patches he may have to apply tomorrow. Matt can’t see the poetry of his own scene yet, and shouldn’t. He should only focus on the details—he needs to make sure his sauce doesn’t stick.